When you're playing a board game with kids, the theme and setting of the game take on even more importance than usual. As our kids get older it becomes easier and easier to keep their interest on a game based on pure strategy like Othello or Chess, but right now my son and I still typically play one normal game of chess quickly followed by a version where action figures are placed on the board and the pieces talk to each other a lot. Imagination and role playing can be the very best part of board games with the family. This certainly holds true with Mole Rats in Space - a game by Matt Leacock and Peaceable Kingdom. These mole rats are in space? We better put on our astronaut costume! 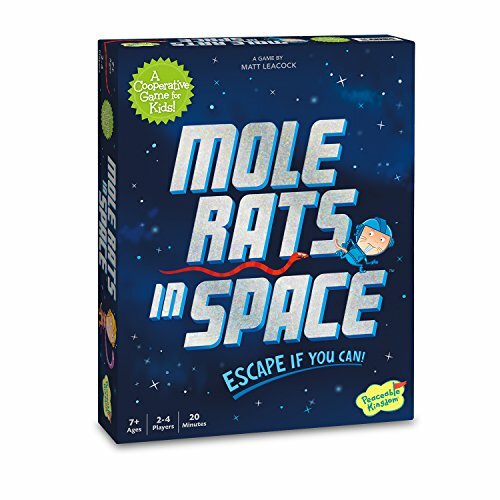 There are snakes loose in the space station and the point of the game is to get your entire team of mole rats into the escape pod before the snakes get one of the mole rats. Whenever we win and blast off in our escape pod before the snakes get us, my son picks the snakes up and says "Nooooooo! We wanted to gobble you up!" "Imagination and role playing can be the very best part of board games with the family." You may know by now that Peaceable Kingdom is one of our very favorite board game publishers, because they make really fun games that we all actually enjoy to play - and their focus is always on cooperation. That not only helps us develop teamwork, but it really helps introduce the kids to strategy by working together with our ideas and plans during the game. Mole Rats in Space functions like the classic Snakes and Ladders (if you land on a ladder you climb up, if you land on a chute you slide down), except sometimes you are moving the enemy snakes, and sometimes you are moving your partners' mole rats too. Everybody has a common goal of collecting all of the emergency equipment - duct tape, food, map, and, of course, toothbrush - and making it to the escape pod before one of the mole rats is bitten twice. Every mole rat has a med kit that can be used to heal one snake bite. Cooperation is necessary because everyone can decide together the best direction to move the mole rats and the snakes during everybody's turn. "You really never know what is going to excite your kids and get their imagination going." Do you know the phenomenon where you buy your kids lots of presents for a birthday or Christmas and they are more infatuated with playing with the wrapping paper or crawling inside the cardboard box? You really never know what is going to excite your kids and get their imagination going. Mole Rats in Space has something unexpected inside that my son was really excited about. There is a an envelope inside that says "Are you READY for the CHALLENGE?". On the back it says "Don't open this envelope until you've won 3 games!" - and there are 3 blank squares for 3 checkmarks. My son was unexpectedly super excited about this. Somehow this sparked his imagination even more than the astronaut mole rats being chased by space snakes. We actually won the very first time we played and got to put our first checkmark. "What do you think is inside?" he asked. "It could be anything!" he said. "It could be, like, a coupon for ice cream!" It actually took us quite a few tries to get all three checkmarks - we probably lost this game more often than any other Peaceable Kingdom game. For days my son would ask if we could play mole rats again to try and get our final checkmark. What we needed to do was plan our moves better. You are able to look ahead at future moves because everyone has their next card sitting face up in front of them. That way you can better avoid those wily snakes and land your mole rats on ladders more often. And then we won the game for the third time, shot our escape pod into space while the snakes screamed after us, and put our third checkmark on the mystery envelope. There wasn't a coupon for ice cream inside, but we were all still very proud and excited, and my son was immediately ready to put our mole rats back to the start and try again. Have you tried any of the cooperative games published by Peaceable Kingdom yet? Do you have any games where the setting really inspires your kids? Share them with us in the comments below.